Invincible - A great battleship and a great beer! 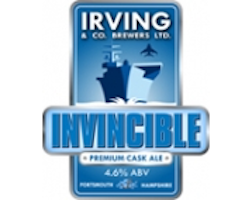 Invincible is a full bodied medium chestnut coloured premium cask ale with an initial sweet malty flavour balanced with a subtle bitterness. The beer finishes with a delicious citrus and spice hop character.